Do You Know What Coconut Oil Can Do? Coconut oil is one of the best tools you can use to make your body healthier. When you switch from other types of oils to coconut oil, you are making a long-term investment in the health of your body. 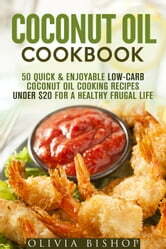 This book will help you not only understand the health benefits of using coconut oil in your recipes, but you'll also find tips on low-carb eating, getting the right nutrients and not spending everything in your bank account. It is possible to create delicious meals in a short time at low cost and still eat healthily. Many people are under the impression that you have to spend a lot of money to eat healthily. You don’t. Read this book and find out how. Once you understand what coconut oil can do for you, you won’t want to use anything else. You’ll love the flavor and the health benefits. Adding the following recipes to your diet plan will keep you eating low carb, delicious meals at a low cost. Don’t wait another minute. Learn how coconut oil can improve your health, your meals and your life.